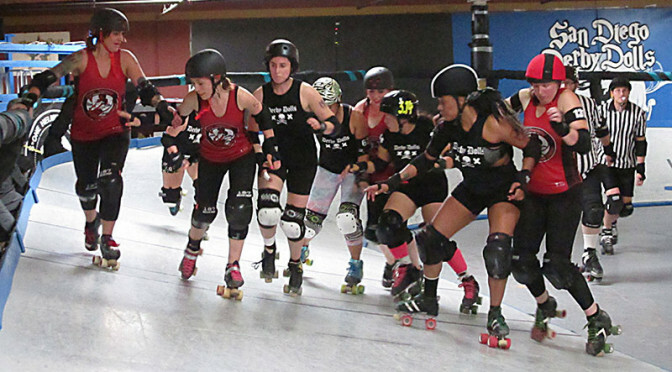 Last weekend, the Roller Derby Coalition of Leagues and the San Diego Derby Dolls presented Derby Daze, a four-team round robin tournament featuring lower-tier RDCL teams. The SoCal banked track triad of Los Angeles, San Diego, and the OC Rollergirls all fielded squads. Contestant number four was Penn-Jersey Roller Derby, which came in all the way over from Philadelphia. To the surprise of no one, the L.A. Doll Parts went 3-0 and easily took home the winner’s prize. The Psycho Ex-Girlfriends, primary travel team for OC Rollergirls, went 2-1 and was second place. Host San Diego had its Sparks B-team grab one win, the most exciting of the event, and finish third. This left PJRD with no wins on the weekend, sending the She-Devils back to the east coast with some more training to do. The goose egg for Penn-Jersey will not phase it, however. Starting out rusty, the team got better as the weekend went on. Impressively, this was happening as it faced increasingly difficult competition, looking its best against L.A.’s B+ mixed team of subpool and home team skaters. The Penn-Jersey coaching staff mentioned they were happy for the opportunity to get some tune-up work in ahead of the team’s impending entry into Battle on the Bank VIII, the RDCL national tournament, coming up next month in Seattle, Wash.
More to the point, Penn-Jersey was happy that the opportunity existed in the first place. The Derby Daze tournament was the first of its kind for the RDCL. Until this year, banked track teams only had Battle on the Bank to look forward to for multi-bout/tournament competition. L.A., S.D., and O.C. have the luxury of proximity, letting them face an appropriate level of competition whenever required. Every other league with a banked track is not as fortunate. Fellow RDCL members Arizona Derby Dames and especially Titled Thunder (Seattle) are quite isolated. They make it out for an interleague game or two every year outside of BotB, but it takes one or two looooooooong trips to do so. Which is not ideal. Running a banked track organization is exponentially more expensive than an equivalent flat track league, so getting bang for the buck in experience-gathering travel games is absolutely critical for competitive progress. With Derby Daze, the RDCL has given a team like Penn-Jersey the perfect value proposition. Including Battle VIII, it will play in at least five interleague away games in only two travel trips. This kind of workload would not be out of the ordinary for a top flat track team, but for a banked track league stuck all the way out in the northeast with no nearby peers, it’s enormous. It’s also huge for the Coalition in general, which has recently been seeing some good news appear along side the list of bummers the community is still dealing with. Leagues in Seattle, Salt Lake City, Houston; and San Angelo, Texas are still trying to secure permanent facilities. But that hasn’t been stopping most of them from playing in regular public games on their tracks to keep the interest in them going. After closing the iconic Doll Factory in December, RDCL flag-bearer Los Angeles has finally settled in its new location and will be resuming its home season next weekend. After a stretch where a number of leagues closed up shop, there has been a surge of interest from those looking to take in those lonely banked tracks and give them new homes. A few months ago, the Sun City Roller Girls of El Paso, Texas acquired the track used by the former Sugartown Rollergirls of Oxnard, Calif.1 and re-raised it. The league has wasted no time, jumping right into a full home team season for 2015. Also add to the list of newly-banked leagues Deadly Rival Roller Derby of St. Petersburg, Fla. It trucked in its track from Reno, Nev. and put the finishing touches on it just days ago. It is beginning to recruit, something that should be relatively easy to do given that it has the only banked track in the entirety of southeast. The RDCL2 has been working hard behind the scenes to make and keep banked track derby more viable for skaters in the long run. New initiatives like the Jantastic Invitational and the RDCL All-Stars are creating an avenue for the most talented banked trackers to test their skills against the best of the flat track. Battle on the Bank has always been there, but with events like Derby Daze to support it, mid- and low-tier teams can get a learning boost more quickly than before, making the showcase tournament more competitive and more attractive. The arrival of the banked track at RollerCon will also improve things considerably. Not a lot of people have seen a banked track game. Even fewer have skated in one. There will be a great deal of buzz around the new track when everyone converges on Las Vegas, and almost certainly a desire to skate on one again once everyone disperses. If that buzz and those desires make their way to areas with skaters who have been flirting with the idea of creating a banked track league from scratch, their RollerCon experience might just be the thing that makes them pull the trigger. The next few years will be very interesting for the RDCL and other actual/potential banked track owners around the country. The timing is right, or will be soon, for an upswing in banked track league numbers and skater population. How dramatic that upswing will be will be dependent on how quickly leagues without a permanent facility can get back into one. Texas, The State, is of particular interest, having four banked tracks (El Paso, Houston, San Angelo—and yes, even ol’ TXRD in Austin) in various states of fit and finish. If all of them can get their houses in order and then get on the same page, there would emerge a central hub to pair with the western core (Los Angeles, San Diego, O.C., Arizona, Seattle). And if those talked-about tracks appear in the east, around Pennsylvania, Florida, and points between? The RDCL may be able to truly go national. If the RDCL wants to get there, it must exploit its advantages. The spectacle of the banked track is the most obvious one, but that alone doesn’t mean much if the game being skated on it is very boring to watch. (As was the case as recently as 2012.) The RDCL has a very marketable game that it can sell to the general public and to the sponsors they attract. Crucially, this still applies even if the level of skill on display isn’t particularly high. This aspect of banked track play should not be ignored by the greater roller derby community. As it happened, there was a derby couple from out of town that caught word of Derby Daze at the last minute and made it for the last few games of the weekend. Both skate for very highly-ranked flat track leagues3, so they know a lot about how intense and engaging high-level derby can be. That is, until they saw banked track play live and in person. They were immediately hooked, noting how much more intense the banked game was and how much more sense RDCL rules made compared to their WFTDA counterparts. “You would never see this kind of speed or aggressiveness in the WFTDA,” they remarked—during a game where Los Angeles’ B-squad was blowing out Penn-Jersey by the score of 228-75. If that little slice of RDCL derby could blow away two flat-track lifers, imagine a future where everyone in the country gets the opportunity to step on a banked track and be the one doing the mind-blowing. Wouldn’t that be the day? The team I skated for—and track I skated on—for almost 2 years. The San Diego Derby Dolls in particular, which have been holding up the Coalition while Los Angeles was dealing with its facility issues and change of ownership. Her from WFTDA #67 New Hampshire, who is fighting to get a spot in the Division 2 playoffs; him from MRDA #8 Mass Maelstrom, who is embarking on a stiff schedule to try and hold on to the last men’s playoff spot.